If you love your Amazon Echo, your kids can enjoy their own as well with the new Echo Dot Kids Edition! Today, pick up the Echo Dot Kids Edition for $49.99. This is a temporary discount and a great savings from the MSRP. Even better, right now you can save $110 when you buy thee of these. Let me explain your savings. Each Echo Dot Kids Edition is $69.99. You can add three to your cart and pay only $99.97* or $33.32 each!) That allows you to fill your home or put one in each kids room. Otherwise, split among friends! That is what we did. You can also get the Echo Dot 2nd generation (without parent controls and with out some of these unlimited freebies), for $39.99 for $10 off when you buy two. This makes each $34.99 when you buy two. The Echo Dot Kids device comes in a kid-friendly case, plus a 2-year worry-free guarantee. Plus you also get 1 year of Amazon FreeTime Unlimited that gives your kids access to hundreds of hours of fun and educational content, including ad-free radio stations and playlists, Audible books, and a growing list of premium kids skills. Easy-to-use parental controls in the online Amazon Parent Dashboard let you set daily time limits, review activity, or pause Alexa on the device. 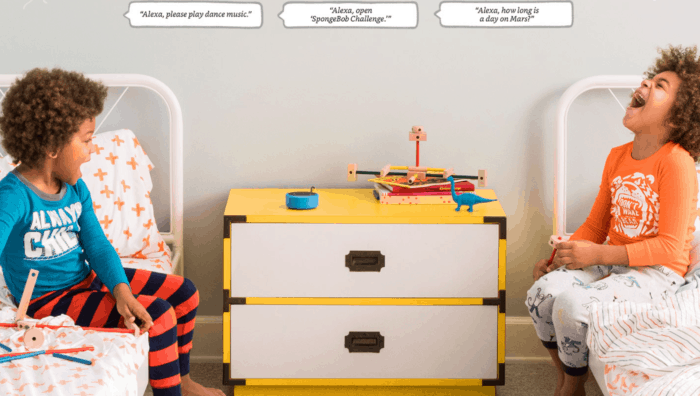 It’s everything you love about your Amazon Echo but the kids version! So my favorite feature is calling the kids to dinner – their room is too far away. I assume you could also call them to wake up, stop talking, etc. Remember you get FREE Shipping on Amazon when you spend $25 or FREE shipping with Prime, though right now Amazon is offering free shipping to everyone! Find more Amazon Deals and our Black Friday and Cyber Monday Deals on Frugal Coupon Living.